The photo below is being shared and circulated by Facebook pages that are ran and managed by Duterte supporters. 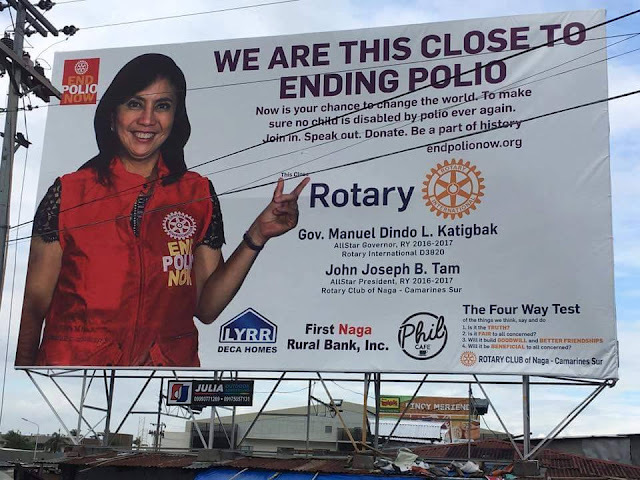 It's a billboard featuring Vice-President Leni Robredo who is supporting a campaign by the Rotary International to eradicate polio from the face of the planet. 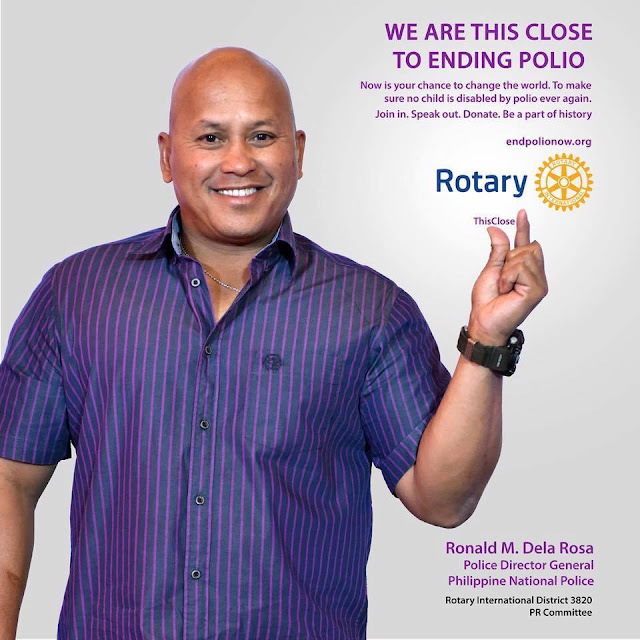 The anti-polio campaign is called End Polio Now and you can check out its website here. For those not in the know, the Rotary International is an "international service organization whose stated purpose is to bring together business and professional leaders in order to provide humanitarian services, encourage high ethical standards in all vocations, and to advance goodwill and peace around the world. It is a secular organization open to all people regardless of race, color, creed, religion, gender, or political preference." [Source: Wikipedia] This is a non-profit organization trying to create a better world, a world free from the debilitating effects of polio. In short, Robredo is lending her influence as one of the top leaders in the country to help drum up awareness for the anti-polio campaign. Unfortunately, many Duterte supporters are so misguided and ignorant to the point that they lambast her for doing something noble. She's supporting a cause that will help in achieving a polio-free world. Imagine the number of people who are now aware of the campaign because the second most powerful person in the country has lent her face and her clout to the cause. 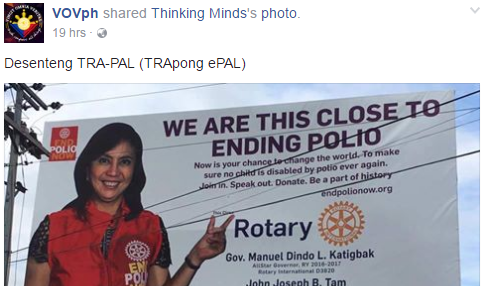 It's saddening to see Duterte supporters calling her "epal" and "makapal ang mukha" for allowing her face to be used in a billboard that simply wants to create awareness about a nasty disease. Credit to the owner of the photo. Here's Thinking Minds, a Facebook page that has nearly 200,000 followers. And here's VOVph, another Facebook page ran by a Duterte supporter. 1. "HAHAHA! Winner to si Lugaw. Same strategy ni Roxas...laging EPAL lng. Tarsier eyes..horsey smile..boom!" 2. "Umepal. hahaha.. DOH naman ngayon ang gusto gampanan....Ganyan talaga pag hindi nya alam ang papel nya sa buhay at basta na lang sya sumusunod sa mga bossing nyang dilawan." 3. " I think it's much better if they remove the billboard. For safety issues and iwas epal na mga pulitiko. If they want to campaign them selves do it online everyone have a gadgets nowadays." 4. 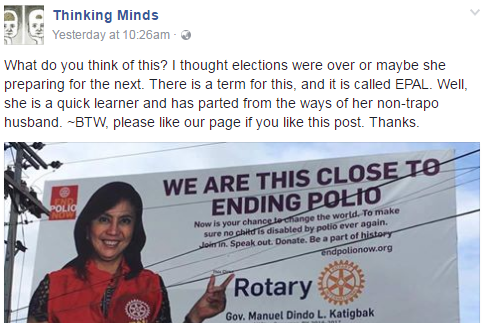 "Poster girl ng polio kahit wala siya kinalaman sa programa. Sunod poster girl ng TB. Next poster girl ng cancer. Tapos magiging poster girl ng STD, aba sobra naman ata." 5. " Nakakahiya ka Leni Pera naman ng bayan yang billboard na yan fustu mu lang makita ang muka mu ng poblico nakakasawa na tingnan Ang ngiti mu akala mu gwapa ka?" But you know what's ironic? PNP Chief Bato dela Rosa also lent his face and his support for the anti-polio campaign. But where's the outrage from the Duterte supporters who are criticizing Robredo for doing the same exact thing.